To explain my experience in Cortina, I can use the Cortina symbol of a tree to represent what I have learned this year. I think one of the most important factors for experiencing growth is the need for strong roots, as the symbol reveals the tree’s roots to us. Cortina has given me a wonderfully positive community (or soil) to grow from. I have developed a strongly connected network of friends who appreciate who I am and deeply care for me. They make me feel safe and grounded. The trunk of the tree represents the growth I have been able to produce from this positive community. I feel that I have become more patient, more self-aware, and more vulnerable, just as a tree is vulnerable to its surroundings as it reaches out. 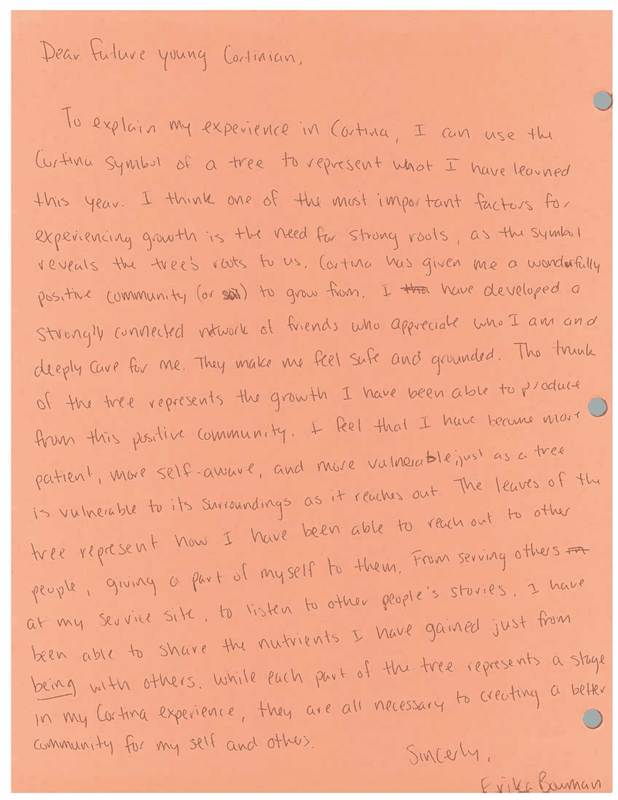 The leaves of the tree represent how I have been able to reach out to other people, giving a part of myself to them. From serving others at my service site, to listen to other people’s stories, I have been able to share the nutrients I have gained just from being with others. While each part of the tree represents a stage in my Cortina experience, they are all necessary to creating a better community for myself and others.